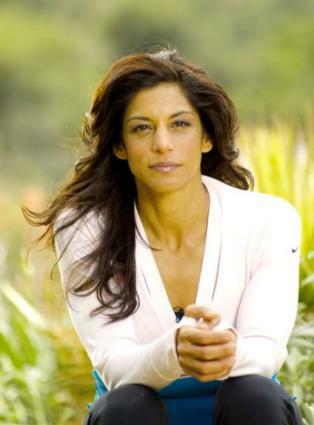 Patricia Moreno, founder of intenSati. Fitness instructor Patricia Moreno combines life coaching and exercise for a powerful mind/body experience called intenSati. This program helps practitioners delve deep and reveal the best they can be through daily affirmations, yoga, martial arts, and dance. Moreno believes the power of deliberate thought motivates everyone to take positive action. Twice-named "Best Fitness Instructor" by Allure magazine and ranked as one of Shape magazine's "Top 10 Women Who Shape the World" in 2006, Moreno is also an accomplished kickboxer and dancer. She's a regular feature on the Sirius Radio Network and a Nike-sponsored athlete. LoveToKnow Yoga asked Moreno to share her intenSati philosophy, as well as a few guilty pleasures. LoveToKnow Yoga (LTK): You've mentioned in previous interviews that you once struggled with weight and eating disorders. Often, it's easy to blame "the media" for distorting the image of women. Do you believe that, or is there something deeper at fault? Patricia Moreno (PM): I don't blame the media. My relationship to food was one in which I always felt guilty about food. Now I realize that the feeling of guilt or shame about anything is exactly what keeps us stuck in the drama of food issues. Now I know that self-acceptance and the practice of being able to keep my word to myself is what I needed to redefine my relationship with myself. That is what I teach others now. LTK: The intenSati philosophy includes not only body movement, but also positive affirmation. Many yoga instructors add affirmations to a daily practice. Why is your combination effective? PM: Studies show that we have approximately 60 thousand thoughts a day, and 95 percent are repeated. We are stuck in what seems like a pattern of actions that we feel powerless to change. intenSati is the practice of deliberate thinking. We put into action powerful thoughts and beliefs that support the intentions we hold to change and transform our life. For example, if someone wants to lose weight, but believes he or she will not succeed, then that person, unfortunately, will not lose weight, because thought inspires the action taken. In intenSati, one of the thought patterns we practice is, "I believe I will succeed!" We hold this thought or say it repeatedly in rhythm while we do a simple series of punches for a minimum of one minute. In this, we are thinking, speaking, and acting in a way that we can embody the belief. This new thought pattern we hold becomes real and moves us into a powerful state. In an instant, we can change our mind and in an instant, we can change how we see ourselves and then our actions become powerfully inspired. Basically, we practice feeling good. When we feel good, we make better choices, which leads to feeling better. When we feel better we attract better opportunities. LTK: One of your quotes is, "All I need is within me now." The practice of yoga also tries to teach the power of respecting the present. What steps help people along that path? PM: Another mantra I use in class is, "I accept where I am, and I am ready for more." The biggest problem we face when we try to change is starting from hating or disliking where we are. Hateful thought leads to hateful action; loving thought leads to loving action. When we practice starting with gratitude or acceptance of now, we are in a loving state. Any action that we take from love breeds more of the same. If we never learn to appreciate what we have now, we are always in a state of yearning or dissatisfaction. Even if we do achieve a new state, we most likely will only be satisfied for a moment before we yearn for more again. I call my practice intenSati because sati means mindfulness, and we strive to be mindful by what we think, feel, and do in the moment, because each exercise has three components: the thought, the attitude, and the action. LTK: Yoga and your other specialty, kickboxing, seem to be two very different fitness options! How do you think they are the same? PM: Both are exercises that have been practiced for hundreds of years as a means to achieve a higher level of awareness of personal potential. They are both ancient art forms that offer the practitioner a daily practice of mental and physical discipline in order to unite mind, body, and spirit, and experience the power of awareness or a spiritual awakening. LTK: Please describe your personal yoga routine each day. How do you prepare, and what poses do you -have- to include in your practice? PM: I begin each day with a 20-30 minute meditation and most days, I meditate in the afternoon as well. This is how I prepare for my day and my practice. I start my physical practice with a series of standing poses, especially the Warrior series and Triangle poses. Often I do this with cables to help work pose with different levels of intensity. I follow that routine with handstands and usually end with backbends and forward bends. My personal yoga practice is usually about 20-30 minutes each day. LTK: What adds to your satisfaction as an instructor? PM: I love what I do because of the joy I see in my students faces or in the stories they share with me about how their lives have changed. My intention is to awaken people to their own magnificence, and often when tears flow in class I feel it is because they have had that experience. It may sound odd, but I love when people cry these kinds of tears in class! I feel like that just got a glimpse of their own preciousness. LTK: What is your guilty pleasure? PM: I think I would rephrase that question to be, "What can I now allow myself to indulge in without guilt!" So many things! Chocolate cake, or really any chocolate anything. I love a great New York bagel with butter, a nap in the afternoon, and buying a new dress at my favorite New York boutique Olive and Bette's. In the New York City area, take a class with Moreno. Try her workout DVD Great Body, Great Life. The author of this article received a promotional disc of "IntenSati" to complete this interview.